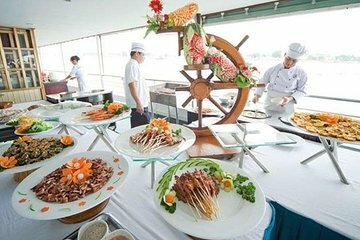 Questo tour a Ho Chi Minh City combina uno spettacolo di marionette sull'acqua con una crociera per cena per una serata divertente. Lo spettacolo di marionette di 1 ora ti introduce in una forma d'arte tradizionale nella cultura vietnamita, eseguita in una piscina dove l'acqua è il palcoscenico. Poi una corsa in bicicletta ti porta al porto per un giro panoramico in barca lungo il fiume Saigon, cena inclusa. The puppet show was great! We were picked up at our hotel by cyclo and driven to the theater. This was such an experience since we were right in the scooter traffic, it made you really experience the city life. The dinner cruise was not good at all. I would recommend just doing the water puppet show and skipping dinner cruise. Puppet Show is interesting but the dinner cruise does not meet expectations. The Water Pupptet was amazing, never saw anything like it. Found out the history of the Water Puppet Show which was also very interesting. Must see. As for the Dinner Cruise, seeing Ho Chi Minh City lit up at night was great. The dinner part, no so, rubber chicken fare. One of the best tours we did, the puppet show was great and very funny, even though it was in Vietnamese we could still understand it. The Dinner cruise was great as well, a lot of great Delicious food and great views along the river.